New owner of an old bus! 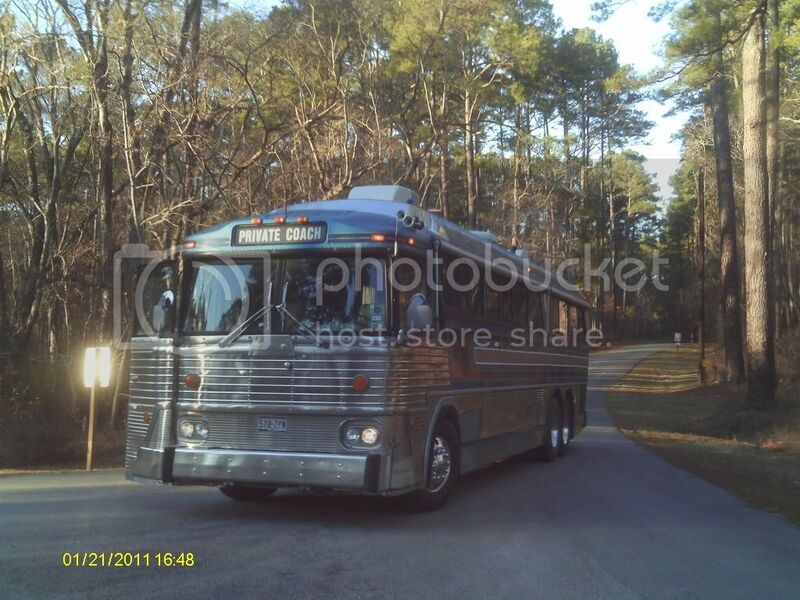 We recently purchased a 1973 MCI converted by magic carpet coaches. This bus was owned by jack and Mary Morrisroe who some of you may know. Jack passed on earlier this year and was a friend of ours. My wife and I are new to bussing and the RV life. We purchased the bus in late fall so decided to do some learning and wait until spring to register and insure it. It was a challenging learning process since Jack was not here to help. The bus was well taken care of and was garaged so it is in beautiful shape for its age. I'm a electrical engineer by trade and always been a mechanic. I have to admit to being a bit overwhelmed by the 450hp DD 8V92 that was installed in 2000 with only 30k miles on it but I'm learning! We have some work to do updating the interior but really minor things. Since jacks health was failing for a few years, the bus was not used much in the last 2 years and its age is showing with things like coolant hoses and belts, many of which I have replaced. One unusual thing about the bus is that is was a "freighter" for UPS back in the 70's so it has dual tires on both rear axles and I remember jack telling me that this allowed for larger brakes and weight carrying capacity....it also means 2 additional tires! We live in CT and both of us are in our 50's and still working. We do have the advantage that we can work from the road to a certain extent. We are thinking of some local trips in the spring to get our feet wet driving it and then a trip to AZ to see family. Also thinking of the FMCA rally next year in Wyoming. I will post some pictures soon. Just looking for thoughts, comments, advice and friends of Jack and Mary. Re: New owner of an old bus! Welcome to our group of deranged people from around the globe! I am looking forward to seeing a few trillion pictures! You can see our build here. Well dr. Steve, you have one nice looking bus, I love the old style.....you have been a busy man! Will post some pictures In a few days. Thanks for the welcome! What you've got there in Jack's MCI is what's known within the industry as one of the somewhat rare "combo" cars that Greyhound cobbled up. The goal was to have a more modern version of the Scenicruiser's capability for hauling package express. 'Hound had converted a number of Scenics to only carry 10 passengers downstairs, with the whole upper deck (plus baggage bins) stuffed - literally! They started with MC-7s, then shoehorned a Scenicruiser rear end under the 7's body shell. In the process, they had to shorten the wheelbase, as evident by the smaller rear baggage bin (stock 7's all had the same size bins). Additional changes included a side-mounted radiator with greater capacity than the OEM 7 set-up, as well as other minor items to make everything fit and work. IIRC, they also installed HT-740 automatics, rather than the original 4-spd. Rear brakes are the same as the Scenics, but you've got more capability due to 10 tires instead of eight. I have never heard of UPS utilizing Seven combos, not sure they'd buy a "worn out old hound" as an experiment. However, Larry Plachno, the editor/publisher of National Bus Trader (an industry trade magazine), had a MC7 Combo that was converted into an RV for awhile. (www.busmag.com) If you sent him a note, I'm sure he'd answer some combo-specific questions for you. If you can, even tho it's short notice, try to get down to Arcadia, FL for the big annual rally being held at the Turner Center. You'll learn more in 3/4 days from all the other busnuts in attendance than a year's worth of perusing the boards. There are other bus rallies held thru-out the year, check out the calendar tab above to see what's been posted. You'll also find some listed in the FMCA mag every month, too. Thus, welcome to the madness! The busnutitis is incurable, but it can be controlled. All it takes is some diesel in the tank and the will to go! PS: Please take a couple minutes to edit your profile. Add a signature line that includes at least your first name, home base city/state, and bus make/model. This will help us help you with question and referrals. No sense sending you to OR if you're in CT, right? You might also discover that there's another busnut nearby, too! Welcome to the board. I see your in Woodbury Ct, I am in Berlin Ct just south of Hartford off rt 5. Working on my conversion. If you ever want to get together let me know. I would love to see yours, still trying to get idea's. Welcome to the madness I too have a converted MC7 Combo and after 3 years I am still learning about mine. The MC7 combo being a mix of the MCI and Scenicruiser makes it challenging sometimes to find parts. One source I have found to be of great help for parts is Luke @ US Coach. There are others here too that can help when needed. Again welcome and enjoy the ride. As RJ said, the MC7 Combo was basically a GMC PD4501 in MCI clothes. With that you eliminate two weaknesses of a normal MC7. One is the weird high dual radiator setup using two squirrel cage blowers to pull the air through the radiators with it's very long V-belt. With your setup you use a more normal radiator and fan setup-so hopefully you won't have any over heating problems. And second-with the 8 tires in the rear, you eliminate the tag axle problems. I don't know what tire size you have now, but if you have 12R-22.5's, you could easily change to 11R-22.5's (you're only allowed 34,000lbs on a tandem legally) that are cheaper and very available at truck tire stores. Welcome to the board, this is indeed a house of nuts. If you bought a bus, without knowing anything about bussing, (like I did) then you will fit right in. I remember on the drive home, thinking, have you gone mad, what have I done now. However, with the help of many many members of this board, I've learn sooooo much. Please ask question, someone here will know what it is, how it works, how to fix it, or where to buy it. Get out and use the bus, it's the best way to learn. Start with short weekend trips. Say What Tom??? "With that you eliminate two weaknesses of a normal MC7. One is the weird high dual radiator setup using two squirrel cage blowers to pull the air through the radiators with it's very long V-belt. With your setup you use a more normal radiator and fan setup-so hopefully you won't have any over heating problems." I have a %c and it has the weird (not) dual radiators and the squirrel cage and long V- belt and has no overheating problems. Just saying. Well, you guys have all been great! I thought the BB would be full of new $500k buses and I am surprised and happy to see many owners of the older buses! I just love the classic style over the new ones...many great comments, can't wait to get out in the spring and meet some of you. Very good advice on the tires, the bus has 10 Michelins but they are pretty old, plenty of tread but the big fear is the dry rot. I am planning on the big bill in the next couple of years. Along with the bus, I got a ton of parts and a full set of manuals for the MC-7 and even the MC-9 and the rebuilt DD motor. One other problem I have is that the original bus AC has leaked out all the freon, I know it was converted and I have freon and a leak detector but I question the wisdom of trying to make that old system leak free. Obviously I can run the generator and house AC but that seems inefficient. I have been looking at the 24vdc truck split systems and that might be a way to go??? I know you all need pictures, I will get on the other PC tonight and post some.....can't do it all from the iPad. I removed my coach A/C unit. Use the space for storage. What I was told, was that rebuilding the over the road A/C unit was $1000.00 to $1,400.00. That they don't set for long periods of time without drying out and needing a rebuild again. Sometime it would be nice to have it. The two overheads do a good job, unless I'm driving into the sun. Just my 2 cents. I'm sure others will add to this. First off, as others have said WELCOME TO THE WORLD OF NUTS! Secondly, others have mentioned learn LUKE's # by heart. ( http://usc17.tripod.com/ ) He will be a world of help in supplying parts and info for ya. He can also help ya decide if it's worth repairing and keeping the original OTR A/C. Or you can contact Lamar Welch @ http://www.welchindustries.com/ he and his company are by far hands down THE BEST in the industry when it comes to motor coach A/C. Most of the folks that have those types of rigs are afraid they'll get dirty reading and sharing with us "common folk" here on these boards. PS don;t let the couple of fancy rigs in our (dad & I) fleet fool ya. Yes they are those HIGH $ rigs, but they are still working to pay for themselves before they can be converted. I would recommend against keeping the OTR (Over The Road) A/C system, unless it is working great. Even if it was working and in great shape, (yours is not) it robs horsepower from your bus' engine, and weighs more than an ex mother-in-law. And in a vehicle that old, sooner or later you will get some impossible-to-find leaks. All the comments make me think I was on the right track with the AC, It doesn't make sense to keep it. The bus now has 3 built in AC units, not rooftop so running the genset or plugged in, I'm fine, I've checked them all out and they work great. My only problem is OTR. I will be looking at the mini-splits for sure although not sure I want to run them off the inverter. I've got 2000 watts on the inverter but I still like the idea of running them at 24vdc off the bus batteries. Non-Nutmeggers welcome... Highlanders (VT), Graniteers (NH), Massachusians (MA), Islanders (RI), Maineiacs (ME) and Gothonians (NY), etc etc.